Greenpeace really loves bees so much that they regularly hold bee die ins where they dress up in bee costumes and lie on the ground to be sprayed by faux pesticides. Environmental activists have also given eulogies and created memorials for dead bees, as well as organized petitions to ban bee killing pesticides. These events followed instances where 400 50,000 bees were found dead. (50,000 Bees is basically the size of one hive). So why are such activists ignoring a killer that is causing the deaths of tens of millions of bees? An article on Science 2.0 addresses these bee killers truck accidents and why if the bees are in such danger there isn t a wave of protest from activists? Or at least better focus on transportation safety? The author wonders: Could it be that they really don t care about bees after all, and they are just creating one more trumped up crisis with a cute mascot in order to raise money? Not that this matters as we ve written before, the bees are fine. 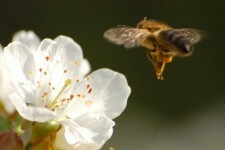 There are 81 million commercial honeybees in the world, and each hive contains about 50,000 bees. Of course, acknowledging this won t get environmental NGOs funding, so the myth is perpetuated.